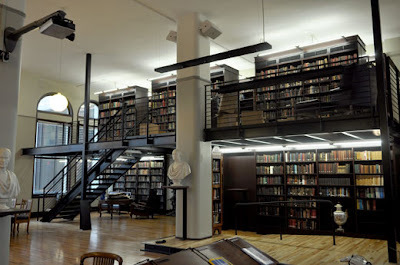 The Mercantile Library is one of those easily overlooked gems, and is located in the heart of downtown Cincinnati. Housed on the 11th and 12th floors at 414 Walnut Street, this quiet oasis in the middle of the city is one of the best kept secrets around town. Few folks have heard of it, and even fewer would be able to tell you where it is, but hopefully that is about to change. Executive Director Albert Pyle states that “there are about 2,000 members currently and we could easily welcome in 2,000 more.” This year marks the library’s 175th anniversary making it one of the three oldest cultural organizations in the city, and they have been in the same location since 1903. Recently, the Mercantile went through its first major renovation since moving into the space over one hundred years ago and UrbanCincy got to take a peek. Mercantile Library restoration photograph by Scott Beseler. “This library deserves it” said Mr. Pyle, as it relates to the renovations made, at a recent preview event. This massive undertaking led by local architecture firm Brashear-Bolton and local construction firm HGC Construction. The main goal was to add modern touches while trying to maintain the Machine Age feel, and based off what we saw, they did a wonderful job. Some of the changes are more cosmetic than anything, such as the movement of the 16 portrait busts featuring presidents and authors, among others, to eye level mounts throughout the room. This was done so that members could appreciate the art and “hold better conversations with them” joked Mr. Pyle. Other changes were made to help accommodate a more modern era such as the replacement of an old and noisy air conditioning on the south side of the reading room which will allow the library to comfortably host events during the summer. In the same part of the room, two story stacks were built out of steel beams which were actually hoisted up from Walnut Street and through the windows so that they could be installed. Two final updates move the library firmly into the 21st century modernization as the card catalog has been made electronic and moved online. Not only is it now accessible through the Mercantile’s website but it actually forced the library to make its first official count of its collection. Totaling over 78,000 books, many first editions, the Merc provides a unique collections as about 2/3 of it cannot be found elsewhere in the city. Additionally, the walls that used to separate The Ladies Reading Room from the rest of the library have been removed to allow for a more open and bright space in the northeast corner of the room. The Mercantile is a membership library, one of only about twenty in the United States, and dues start at $45 for an individual membership. Mr. Doyle stated that many members like to visit on their lunch hour during the week and will actually bring their lunch along with them. Others come to find peace and quiet and have been known to doze off during their visit. Aside from their traditional website, the good folks at the Mercantile also maintain the blog Stacked.